Wilderness Wood has probably been productive woodland for over 2000 years, and may have never been cleared. We aim to manage it sustainable to the highest environmental standards. We examine every aspect of life at the wood, from the impact of the work vehicles to the waste produced in the kitchen, with the aims of reducing detrimental effects and promoting a better understanding of the woodland and the wider environment. Please take away your picnic rubbish and recycle if possible. Use the recycling bins at the entrance to the wood. Wilderness Wood has won the Green Tourism Gold award, has been recognised as a Centre of Excellence by the Forestry Commission and has been awarded the Duke of Cornwall’s Award for Forestry and Conservation and won the international Tourfor Award for sustainable tourism in forests. 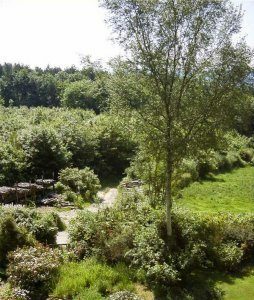 Wilderness Wood has been owned and run by Chris and Anne Yarrow since 1980. They give equal weight to producing useful wood and timber, welcoming visitors for enjoyment and education, and conserving the wood’s wildlife and other resources. Chris is a chartered forester and Anne trained in geography and conservation. 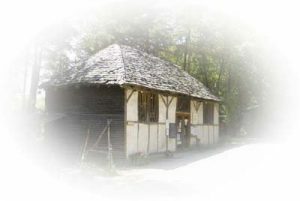 They live at the wood, and built the house, barn, workshop and all the other developments at the wood. They are assisted by graduate assistants, woodsmen, a carpenter, secretaries and several part-time and temporary staff. Follow the trails, or explore the many tracks and paths. There’s a ¾ mile woodland trail, with a leaflet about the wood and its wildlife; a trail leaflet for the ¼ mile easy-access path; a special springtime bluebell path and autumn chestnut trail. Enjoy the views southwards to the South Downs, and talk to the sheep and lambs. In the timber barn, learn from the displays about growing and using wood. Watch work under way in the wood, yard or workshop. Buy wood products grown and made in the workshop (see Garden Catalogue for more details). 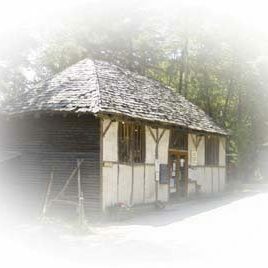 Browse the souvenir shop, which includes many local wood products. Come to some of the many events held throughout the year. 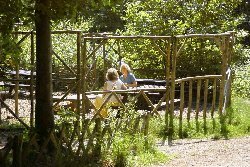 See Visiting Wilderness Wood for prices and location map.